Too often, evangelical Christians regard evangelism as something that only the gifted elite of the Church can undertake successfully. Unfortunately, many approaches to evangelism only serve to reinforce this attitude. Although many Christians genuinely want to share Christ with others, their efforts at evangelism often leave them feeling frustrated and guilty. As a pastor, author Steve Sjogren loved to do evangelism, but noticed that most members of his congregation didn't share his enthusiasm - in spite of their desire to share the gospel. So he began experimenting with a simple approach to outreach called "servant evangelism" that allowed any believer - regardless of gifting - to be involved in sharing God's love with others in practical ways. This book is a collection of 101 ways that Christians can reach out to those around them. Sjogren describes this book as an "interactive cookbook." The concepts for outreach outlined in this "read-and-do" book are designed to be read and then done with a few friends, a small group, or an entire church. 10 book bundle includes USPS Priority Shipping! 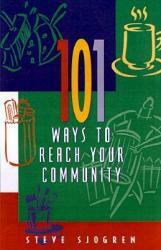 Buy 101 Ways to Reach Your Community (10 book bundle includes shipping cost) and get 101 Ways to Help People in Need at an additional 20% off our everyday low price.